Tis' the season to be jolly! But with this season's cold air, your skin may be feeling the Winter blues. Winter cold and wind can do damage to our delicate skin. During the cold months our skin tends to become dry and ashy and they thirst for moisture. To give your skin the treatment it deserves do it a favor and give it a good scrub at least once a week. It will help your skin glow, feel soft and smooth even during Winter. Afterall, you want to look ravishing from head to toe even underneath those clothes. 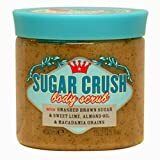 We love this wonderful, inexpensive body scrub because it left our skin feeling extremely exfoilated, smooth and refreshed. With the smell of lime and brown sugar, you will leave the shower feeling delicious! So treat yourself to a little early Christmas present this year and put this one on the top of your wishlist. It will leave your skin feeling silky and absolutely radiant. Click here to get yours! I've tried this one and is so good to feels your skin.And I intend to do it for my entire life! I deserve being pampered anyway.Thanks for sharing this one. I am also thinking to take this scrub.Winter is a very risky time for skin,It can make your skin rough and dry.So this treatment is helpful. Thanks for reading this post. Our skin deserves to be beautiful all year round and this is definitely a must have to keep it looking radiant! I haven't tried a body scrub with a brand like this but I've been using body scrub for some time already and my skin feel refreshed after it.